PVC, i.e. polyvinyl chloride, is a multi-component plastic material that is often applied in the form of pellets. In addition to the previously mentioned PVC resin powder, some other components are needed, e.g. adding plasticizer to improve its fluidity, adding stabilizer to improve its thermal stability, adding lubricant to improve its mold releasing performance, as well as fillers, colorants and coupling agents. By virtue of the different proportion of different components, PVC pellets of different mechanical properties and different hardness are thus created, which usually adopts the IP rating. PVC comes in two basic forms: rigid and flexible. Due the existence of chlorine ions, the PVC material absorbs moisture slightly, so it has to be dried under 75 – 90℃ temperature conditions for about 1.5 – 2.5h before production starts. Melting temperature is one of the most important process parameters for PVC processing. If not appropriately set, material decomposition may be caused. PVC is an amorphous polymer which does not possess a clear melting point. Usually, it melts when heated to 120 – 145℃, but it is able to emit hydrogen chloride (HCl) fumes under 150℃ and emit a large amount of HCl when heated to 180℃. Since it emits poisonous gas during the injection molding process, a lot of thermal stabilizers are needed before the process starts. The adjustable scope of injection temperature is quite narrow. During plastic injection molding, the commonly used temperature is between 140 and 160℃; sometimes the temperature may reach up to 190℃, but injection time should be kept within 20min, or the material will decompose badly. Since material injection temperature is close to decomposition temperature, during injection the temperature should be kept as low as possible and the injection cycle as short as possible, so as to minimize the time for the material to stay in the barrel. Material Temperature Parameters – phase I: 160 – 170℃, phase II: 160 – 165℃, phase III: 140 – 150℃. Due to its poor thermal stability, PVC emits hydrogen chloride (HCl) if heated in the barrel for too long, which will cause the plastic to turn yellow or black spots on product surface. 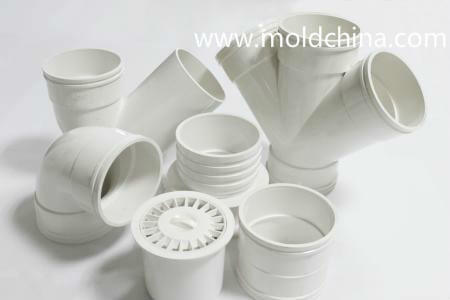 Also, HCl can erode the cavity, so the dead corners of mold cavity and machine head need to be cleansed frequently. Keep the mold temperature as low as possible (usually mold temperature is kept between 30 – 45℃), shorten injection cycle, and reduce post-ejection product deformation for small-size parts, use calibrator and shrinkage controller to correct and control deformation when necessary. PVC features a poor fluidity, so mold gate and runner should be as large, short and thick as possible, with a product wall thickness of over 1.5mm, so as to minimize pressure loss and fill the cavity ASAP. All in all, it is more appropriate to apply a high pressure and a low temperature (injection pressure over 200MPa, back pressure between 0.5 and 1.5MPa, holding pressure is 20% – 30% of injection pressure). The PVC melt features a high viscosity, with a small flow length to thickness ratio, so insufficient filling might occur for thin-walled products. Therefore, gate and runner sizes should be minimized. Shrinkage rate is 4‰; and overflow limit value 0.05mm. If small sized parts are to be produced, it is better to choose the pin-point gate or sub gate; for thicker parts, fan gate is a better option. The minimum diameter of pin-point gate or sub gate is 1mm; and the thickness of the fan gate should not be smaller than 1mm. Injection pressure may reach 150MPa; holding pressure may reach 100MPa. Injection speed: an appropriate injection speed must be employed to avoid material decomposition.